Box Elder County Clerk's Office. 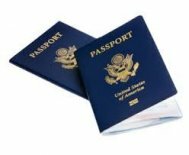 Office hours: 8:00 a.m-5:00 p.m.
A check or money order is required by the passport agency for payment of the passport. Please visit www.travel.state.gov for passport questions and current processing times. You must provide your Birth Certificate, or a Certificate of Citizenship or Naturalization AND a valid Drivers License or Federal/State Identification. An applicant 16-17 years old must personally appear and have at least one legal parent. Children under 16 years old must personally appear and have both legal parents. Social Security numbers must be included on all applications. Parents must appear and sign for a minor and provide current identification and proof of relationship to child (such as birth certificate) when minor is under the age of 18. One U.S. passport quality photo is required. and meet the passport requirements. Photograph may be taken prior to turning in application or we can take them for you at the courthouse. Photographs taken at the courthouse are $15.00 and can be taken at time of service. Checks are the preferred method of payment, and will expedite the process. However check, cash, or money orders are accepted. For faster processing, an additional fee of $60.00 may be paid per passport to expedite. An additional $16.48 may be paid with the expedite fee for the passport agency to express mail (overnight) your passport back to you. Or, you may call the National Passport Information Center (1-877-487-2778) for additional options. Renewals are mailed directly to the Passport Agency. Requirements: Form DS-82, most recent adult passport, one U.S. Passport quality photograph and $110.00 payable to U.S. Department of State. If name has changed, certified copy of marriage license. *The Department of State is issuing the passport card in response to the needs of border resident communities for a less expensive and more portable alternative to the traditional passport book. For printing passport applications, children's issues, foreign entry requirements, and warnings for particular countries, visit the US Department of State website.